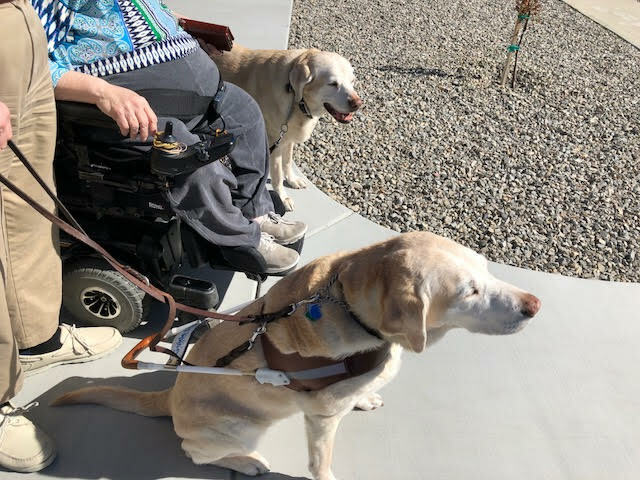 In February of 2017 I decided to retire my seventh guide dog, Africa. Affie, as Karen and I call her, was not seeing quite as well as I would like. Also, she seemed to be more easily distracted than in the past. 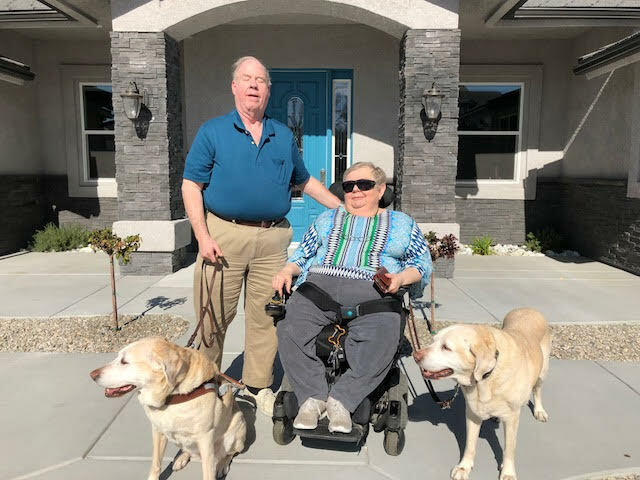 So, I began the process to retire her and to obtain a new guide dog. I have explained this elsewhere. As you may know, Guide Dogs for the Blind breeds their own dogs from the GDB breeding pool. Dogs are selected to be guides based on many characteristics including temperament, walking pace, ability to work in all kinds of situations, work without being distracted by outside issues and size. This is a simplistic list, but you get the idea. ; Not every dog can be a guide dog. 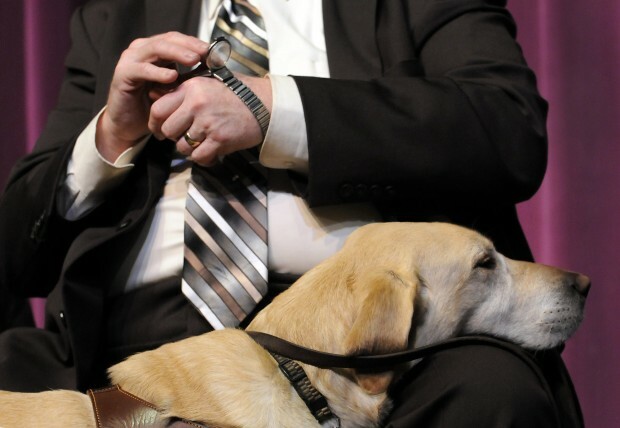 In fact, even with the most popular breed, the Labrador Retriever, only %50 of the dogs who begin the process ever succeed and go on to work with blind handlers. I like to describe it this way: Just as with humans not every dog is cut out to perform a job. Guiding is extremely stressful work for a dog. The chosen dogs take their jobs very seriously. They need a tremendous amount of praise as well as other kinds of rewards which I will describe later. I chose to retire Africa because I knew her work was not what it had been in the past. I have been working with guide dogs since receiving Squire in 1964. I know that if I am seeing that the work quality has decreased then Africa knows it as well in her own way. Also, as we travel, and her work has dropped in Quality I need to correct her more often. This induces stress. My decision to retire Africa was made in the best interest of our team and especially with the best interest of Africa in mind. Since we could not easily keep Africa we chose to give her to her raisers, Bill and Peggy. They came to our home last Friday to reunite with Africa and take her to her next great adventure. As soon as she saw them she jumped all over both. She has seen them every year, so I know that she and they had a great relationship. 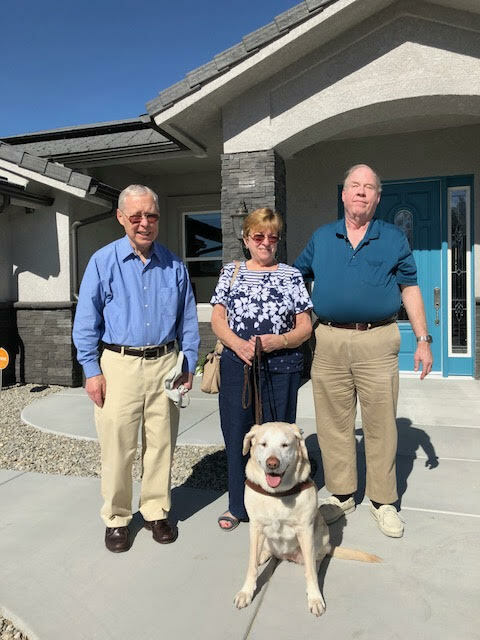 While Bill and Peggy were at our home we took them to lunch at the Spring Valley Country club, a place that was within walking distance of our house. Even though I had Africa in Harness she constantly looked back to make certain that they were following. After lunch when it was time for them to take her and go she left our house happy, tail wagging and without a single backward glance. I guess Karen and I had become chopped liver or something. We have talked with our friends and Africa’s raisers twice since they left us. Miss Africa has settled in quite well and is playing with one of the other dogs in the house. Two other dogs live with Bill and Peggy, but one is too old to play. Here are some pictures of our brief time with Africa’s raisers. Africa is quite happy as you will see. This entry was posted in Africa Retires, New Guide Dog Training by Mike Hingson. Bookmark the permalink. So Michael, I’m curious. Why could you not keep Africa? I know you’ve kept some of your previous dogs. Love your & Roselle’s story! Thanks for sharing!! Nice pictures of all of you. You are right about her doing good and not worrying too much about her. She is in great hands.